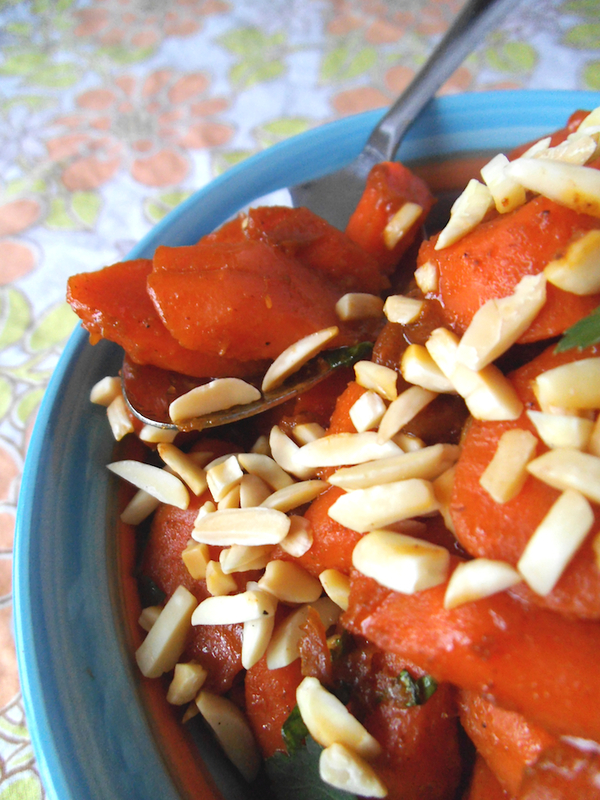 The warm spices of Morocco can take the most common of vegetables and elevate it to exotic new heights. As fitting as these spiced carrots might be for a special occasion like Easter dinner, they are still quick and simple enough for a weeknight side dish. The subtle sweetness of dried apricots compliments the spice blend exactly right–no honey or brown sugar needed. This side dish recipe was inspired by a lovely recipe for glazed carrots that employed apricot preserves. Since my family prefers less sweetness, I took it in a different, spicier direction. Top it all off with crunchy toasted almonds, and you have a side dish poised to become the main attraction. As for an entrée, I recommend pairing these spiced carrots with lamb or chicken. Cardamom-Scented Rice Pilaf with Lamb and Chickpeas would do nicely, as would Za’atar Chicken, which I am keen to try at home once I track down more za’atar. You could also opt to round out the meal with some couscous or Kalonji Seed Bread if you are feeling particularly adventurous. But honestly, even putting these Moroccan carrots alongside a simple rotisserie chicken will make your mouth quite happy. In a small bowl, pour 2/3 cup hot water over chopped dried apricots and let stand for 10 to 15 minutes, until softened. Meawhile, in a saucepan, heat 6 cups of water to boil. Add carrots and cook for 5 minutes. Drain and set aside. Whisk together spices, lemon juice, and apple cider vinegar and add to apricot water mixture. Add garlic and olive oil to empty saucepan and saute for 1 to 2 minutes. Return carrots to pan and saute for 2 minutes. Add spices, salt, and apricot mixture to the carrots and cook together for 2 minutes. Turn off heat and keep warm until serving time. Just before serving, stir in chopped parsley. 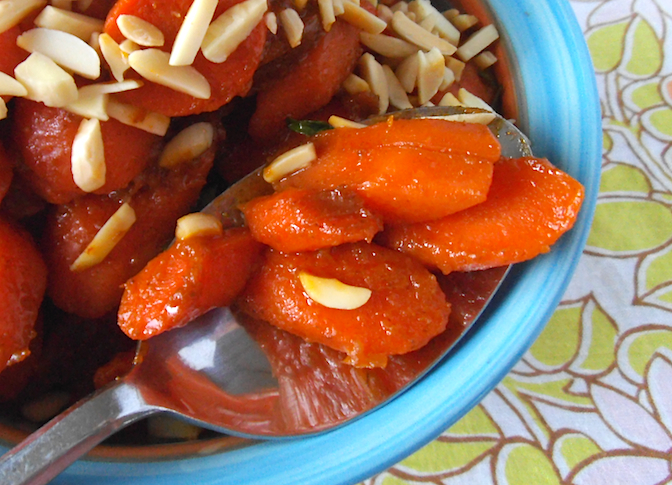 Transfer cooked carrots to serving dish and sprinkle with toasted almond slivers. I share recipes here and at Gluten Free Wednesdays and Allergy Free Wednesdays. Also linked to Savoring Saturdays. Yum! I love Moroccan and Middle East flavors! So yummy! I love that spice palette too. When my husband asked if these carrots were made by an Iraqi friend of ours, I knew we had a winner! This dish looks beautiful! I love taking a kid pleaser like carrots and changing it up so that they can discover new flavors. Yum!! Looks super good and sounds easy enough! Love anything with so few ingredients. Yep, simple is good! Most of these ingredients are easily found in the pantry. Just be sure your ground cumin isn’t more than a few months old. I had to replace mine recently. Thanks! I appreciate the invitation too! 🙂 I’ll be traveling this week, but hopefully I can pop by soon! What a great way to dress up carrots! I love the Moroccan spices you used here and I can’t wait to try this! 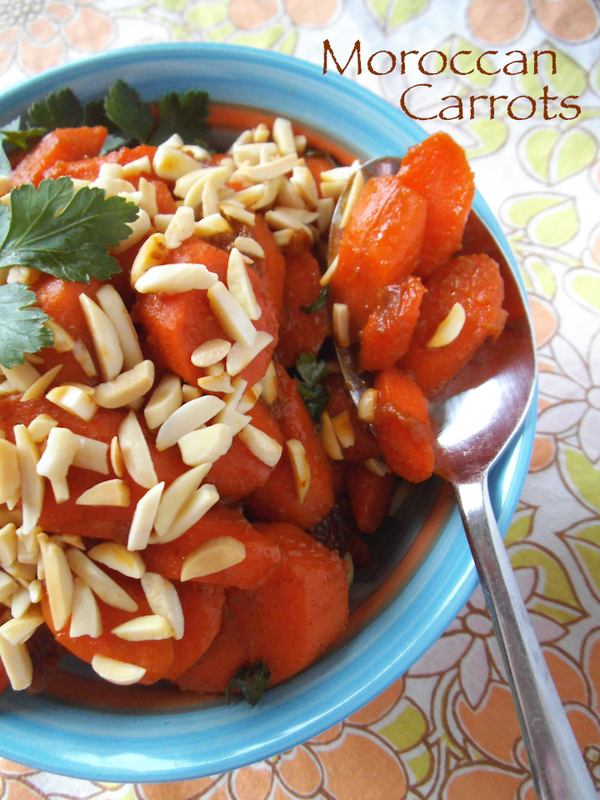 I love Moroccan flavors, these carrots sound delicious! Thanks for sharing at What’d You Do This Weekend? I hope you will join us again this Monday! Oooh i wannna try this! What a delicious flavor twist on carrots! Wow, I’d never have thought to put apricots with carrots. Sounds pretty tasty… 😉 Thanks so much for sharing it at Savoring Saturdays! I’m having so much fun checking out this blog! Your taste buds are great by the way… Who would have ever thought about carrots and apricots?? Genius. Thanks! I was planning on making this again soon. Love those Moroccan flavors! Are these ever gorgeous! I can see that they’d steal the show at any dinner! Thanks for bringing this by Throwback Thursday; we’re already looking forward to what you’ll be bringing next week. Thanks! They are not your everyday carrots for sure!